The scent of vanilla passed by me. With a second sniff I caught the refreshing smell of soil and water vapor. 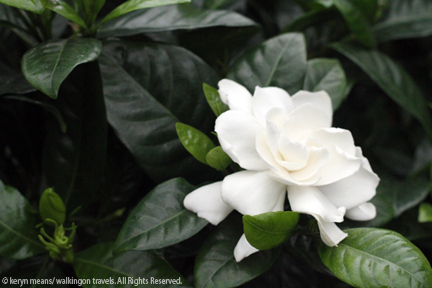 A third sniff brought the sweet allure of … was that jasmine? Could this really be the smell of winter in Seattle? It is if you know where to look. I don’t know about you, but when Christmas is over I am done with winter. After last week’s snowstorm I was ready for spring to get here and get here quick. Seeing as it is only late January I don’t think this will be happening anytime soon. Instead Dek and I just had to look for our own bit of spring. After a satisfying breakfast at the Volunteer Park Café with our friends Nic and Lee, we all headed up the street to the Volunteer Park Conservatory. 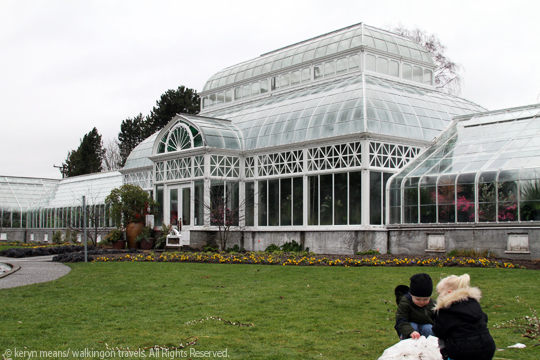 This glass-encased building houses a small but impressive grouping of plants and flowers in five green houses. Almost as important, it is very warm and protected from the elements. The coldest green house was 65 degrees Fahrenheit while the warmest could get up to a balmy 80 degrees. We threw our coats in the car and headed on in to get our fill of springtime in bloom. We only saw one staff member/tour guide during our 1 hour stay, which made this a great parent/child activity. It allowed Nic and I to let the kids lead the way and not vigilantly keep them on the path. When Dek started digging in the dirt of one flowerbed I didn’t feel the rush of anxiety that we were about to be lectured. I was able to go up to him, explain that the plants needed that dirt to stay warm, wipe him off and move onto the next exciting element. Dek and Lee ran along the path soaking in the fresh plant air and picking up pebbles along the way. 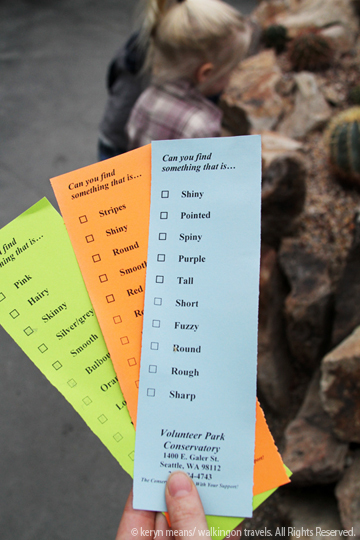 Nic found small sheets of paper with scavenger hunt questions on them just inside the entrance. Our 2 and a half-year olds were a bit young for some of the questions, but they did have fun finding the different colors and shapes listed. 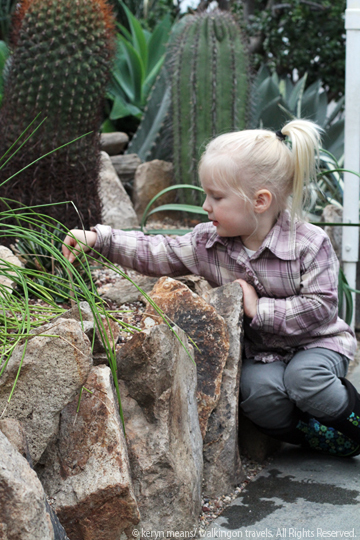 Each kid learned a very valuable lesson in the Cactus House as well; do not touch the plants! Both kids took a turn feeling these prickly succulents and both had to have pokers picked off their fingers. 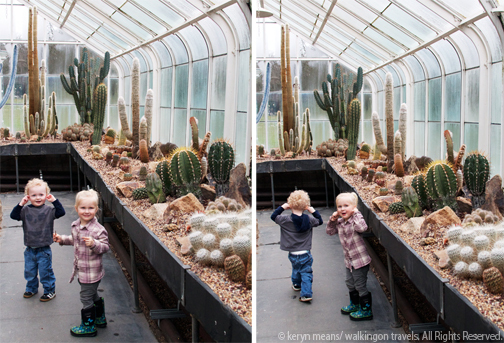 Twenty-four hours later when Dek saw a picture from our visit he commented on the “owy plants.” Smart boy. The small waterfall feature in the Fern House proved to be a bit too tempting for the kids. Within 5 minutes Dek was washing his face with his wet hands, and both he and Lee were trying to sip the water. 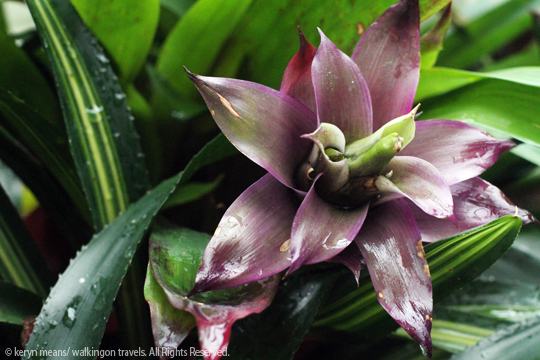 We whisked the kids into the adjoining Bromeliad House where we thought it would be safe. Little did we know that there would be a lemon tree with fruit just at kid height. Now Dek loves lemons. I mean loves them. He eats the rind and all if we don’t catch him in time. Of course he tried to take a bite off the tree. Several times. Seeing as this was not the best idea we headed back to the Palm and Seasonal Display Houses with its orchids, banana and ginger plants, azaleas, African sansevieras and Yucca gigantea. 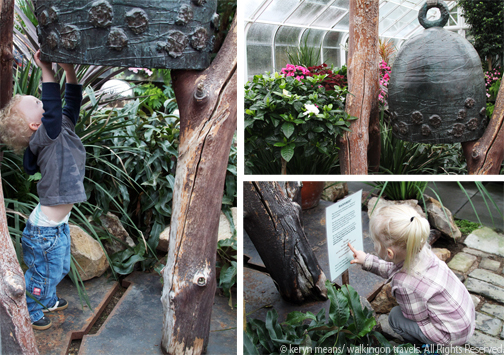 There was also a large bell by a well-known artist from Quakertown, NJ being temporarily housed in the Seasonal Display House. It was just waiting for its home at the Kubota Garden to be ready for it. We will definitely be visiting this bell when it is moved to its new home. Do not touch the bell! We later read the sign below this bell that warned us away. It was hand-crafted by a well-known artist in New Jersey. Hopefully we didn’t cause too much damage. With toasty hands and feet we headed back into the elements to play with the last remnants of snow left on the ground. 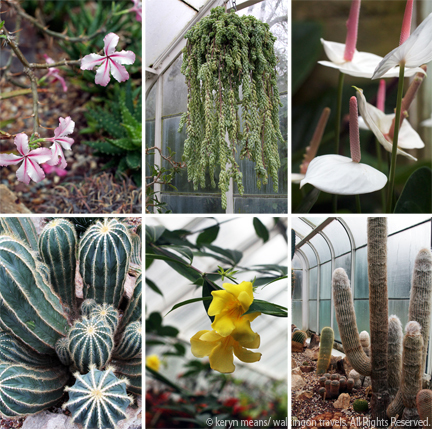 The Conservatory had been the perfect antidote to my winter blues. It filled up part of our morning, kept us out of the rain, but still got the kids exposed to the “outdoors” and nature. I may need to go back every few weeks to remind me that spring is in fact on the way. My bulbs will be popping up before I know it. The Conservatory works with the US Dept. of Fish and Wildlife as a rescue center for plants illegally brought into the country. Hours: 10am-4pm Tuesdays through Sundays including holidays. Closed on Mondays and Monday holidays. Docent led tours available Tuesday through Sunday at 11am and 1 pm. Tours run 30-60 minutes. Free for K-12 students. Others groups pay $25 per tour. You must schedule 2 weeks in advance. Gift shop and resource center is on site. Closed Mondays and Tuesdays. Love the pictures! Isn’t it fun to watch their personalities develop? Beautiful colors, happy smile…one perfect day. Can’t wait for Spring! What a great place to go in the wintertime- and how nice that you could relax and take your time! Thanks for linking up and have a wonderful weekend! As I watch the snow fall, I could use a little spring too! 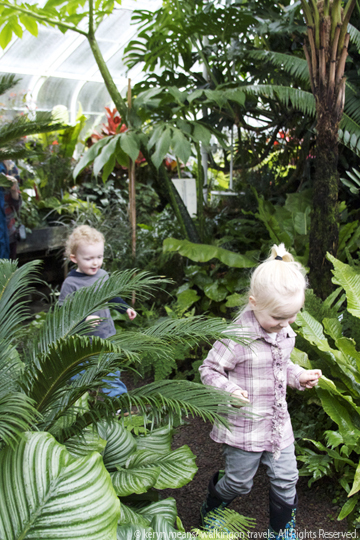 The Conservatory looks like a great place for kids – I love anyplace that has scavenger hunts to get the kids engaged. It looks very much like the conservatory at the Brooklyn Botanical Gardens, where we like to warm up on a winter day! Love the pic of the little one trying to eat a lemon – priceless:) Thanks for sharing – beautiful place! I can’t get my daughter to eat a single bite of ANY fruit and your kid eats lemon rinds??? Not fair.